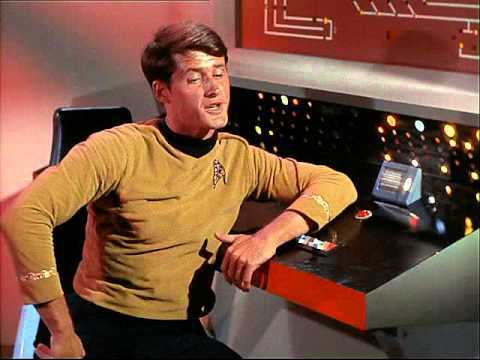 Bruce Hyde, who may be best known for playing Lt. Kevin Riley in the Star Trek episodes "The Naked Time" and "The Conscience of the King", died on October 13 2015 at the age of 74. The cause was throat cancer. Bruce Hyde was born September 14 1941 in Dallas, Texas. He graduated from Northwestern University in 1963 with a Bachelor of Arts degree in 1963. He made his television debut in 1965 in an episode of The Trials of O'Brien. Over the next few years he would appear on several different TV shows. In addition to his two appearances early in the run of Star Trek, he also appeared in four episodes of Dr. Kildare in the recurring role of Dr. Jeff Brenner. He also guest starred on the shows That Girl and The Beverly Hillbillies, as well as appeared in the television movie The Recruiters. Bruce Hyde also appeared on Broadway. He appeared in the productions Absence of a Cello (September 1964-January 1965), The Girl in the Freudian Slip (May 1967), and Canterbury Tales (February 1969-May 1969). Bruce Hyde eventually left acting for academia. He received a Master of Science degree at the University of North Texas in 1984 and a PhD at the University of Southern California in 1990. He eventually became a professor emeritus of communication studies at St. Cloud State University in Minnesota. He also served as Artistic Director for St. Cloud State University's one time summer theatre, Theatre L’Homme Dieu. Bruce Hyde was remarkable as Lt. Riley on his two episodes of Star Trek. In fact, I always thought that he should have been added as a semi-regular or regular character. Never mind that Star Trek would not have a regular navigator until Walter Koenig joined the show as Ensign Chekov in its second season, Lt. Riley was a very interesting character as played by Bruce Hyde. He also gave good performances in both The Beverly Hillbillies and That Girl. It was fifty years ago today that The Beatles recorded the song "Day Tripper" at Abbey Road Studios in London. The song was recorded in three takes and completed in one day. The song originated out of the need to get a new single on the market for Christmas. Unlike many Beatles songs from the era, "Day Tripper" was a true collaboration between John Lennon and Paul McCartney. According to Sir Paul McCarntey, John Lennon originated the idea behind "Day Tripper". According to John Lennon, the song's famous guitar riff was inspired by the 1961 song "Watch Your Step" by Bobby Parker. On November 23 1965 The Beatles shot promotional films for "Day Tripper", as well as the songs "We Can Work It Out", "Help! ", "Ticket to Ride", and "I Feel Fine". One of the films for "Day Tripper" was a straightforward performance clip. The other was not so straightforward, featuring John and Paul behind an airplane prop and George and Ringo in a train carriage prop. Ringo drums without the benefit of a drum kit and at one point takes a saw to part of the railway carriage. By 1965 The Beatles had tired of making live appearances on television shows and often had so many demands on their time that it was impractical to do so. The promotional films would be sent to various television shows around the globe as a means of promoting their latest singles without actually having to appear live. "Day Tripper" was released as one side of a double A-side single with "We Can Work It Out". "Day Tripper" went to no. 1 on the UK Singles Chart, but only peaked at no. 5 on the Billboard Hot 100 in the United States. Regardless, "Day Tripper" proved to be one of The Beatles' most memorable songs. It has been covered several times, notably by Cheap Trick on their Found All the Parts EP, Otis Redding on his album Complete & Unbelievable: The Otis Redding Dictionary of Soul, Jimi Hendrix on his album Radio One, and Type O Negative as part of a Beatles medley on their album World Coming Down. Here is one of the promotional films The Beatles made for "Day Tripper"
Joan Leslie, who started her acting career as an ingénue in such films as High Sierra (1941), Sergeant York (1941) , and Yankee Doodle Dandy (1942), died on October 12 2015 at the age of 90. Joan Leslie was born Joan Brodel on January 26 1925 in Detroit, Michigan. Her two older sisters, Betty and Mary Brodel, were both talented musicians who performed in front of audiences as The Brodel Sisters. Eventually young Joan joined the act and The Brodel Sisters became professional performers on Vaudeville. In fact, Joan would make her film debut as a member of The Brodel Sisters in the 1936 Biograph short "Singing Off". Her sisters Mary and Betty would both have short lived film careers. Joan Leslie made her feature film debut in an uncredited role in Camille in 1936. Over the next several years she would appear in small parts in various films. When she was credited it was under her given name, Joan Brodel. Following Camille in 1936 she appeared in such films as Men with Wings (1938), Nancy Drew... Reporter (1939), Love Affair (1939), Two Thoroughbreds (1939), Young as You Feel (1940), Military Academy (1940), and Foreign Correspondent (1940). At age 15 she was signed to Warner Bros. whereupon she adopted the stage name "Joan Leslie". Her first film with Warner Bros. would be the classic High Sierra (1940), in which she played Velma, a young lady with a a limp who attracts the attention of professional thief Roy Earle (Humphrey Bogart). Joan Leslie would appear in some of Warner Bros.' most important films of the Forties. In Sergeant York (1941) she played Gracie Williams, the love interest of the title character. In Yankee Doodle Dandy (1942) she played George M. Cohan's wife, Mary. In Rhapsody in Blue (1945) she played Julie Adams, a fictional woman in the life of Ira Gershwin (played by Robert Alda). While at Warner Bros. she also appeared in such films as Thieves Fall Out (1941), The Male Animal (1942), The Hard Way (1943), This Is the Army (1943), Hollywood Canteen (1944), and Cinderella Jones (1946). While many of the movies Joan Leslie made at Warner Bros were very successful, she was nearly always cast as the ingénue or the girl next door. Unhappy that she was not receiving more mature roles, she took Warner Bros. to court to get out of her contract. Unfortunately, Jack L. Warner saw to it that the other major studios would not hire her. After around a year she signed a two movie deal with poverty role studio Eagle-Lion. There she starred in the film noir Repeat Performance (1947) and the Western Northwest Stampede (1948). She finished out the decade appearing in The Skipper Surprised His Wife (1950) for MGM and Born to Be Bad (1950) for RKO. In 1950 Joan Leslie married Dr. William G. Caldwell, to whom she remained married until his death in 2000. She had twin daughters, Patrice and Ellen, in 1951. Afterwards she slowed down her career in order to concentrate on her family, although she continued to appear on television and in films. She made her television debut in an episode of Family Theatre in 1951. In the Fifties she appeared on such TV shows as Fireside Theatre, Lux Video Theatre, The Ford Television Theatre, The 20th Century Fox Hour, and G.E. Theatre. The films she made in the Fifties included a number of Westerns, among them Man in the Saddle (1951), Hellgate (1952), Toughest Man in Arizona (1952), Woman They Almost Lynched (1953), and Jubilee Trail (1954). She also appeared in the films Hell's Outpost (1954) and The Revolt of Mamie Stover (1956). From the Sixties to the Nineties Joan Leslie made only a few more appearances on television. She guest starred on the shows Branded; Police Story; Charlie's Angels; The Incredible Hulk; Simon & Simon; and Murder, She Wrote. She appeared in the TV movies The Keegans (1976), Shadow of Sam Penny (1983), Charley Hannah (1986), Turn Back the Clock (1989), and Fire in the Dark (1991). In many respects Joan Leslie was a very underrated actress. Quite simply, she had much more depth and versatility than her sheer number of roles as ingénues and girls next doors would reveal at first glance. Indeed, even many of her ingénues actually had some steel in them to go along with the sweetness. In High Sierra her character Velma actually stood up to Roy Earle, something many men of the time probably would not have done. As Gracie Williams in Sergeant York she refuses to have much to do with Alvin York until he mends his ways. In The Hard Way Miss Leslie's character Katie eventually becomes a party girl, losing her career as a successful singer and actress in the process. While best known for playing girls next door, Joan Leslie was capable of playing women who were not so nice. A prime example is in the Randolph Scott Western Man in the Saddle, in which she played the overly ambitious Laurie Bidwell. Ultimately Joan Leslie had much more versatility than she has often been given credit for. Not only was she fully capable of playing roles other than "good girls", but she was also capable of lending depth to roles that in the hands of a lesser actress might be too saccharine. It is fully understandable why she wanted to leave Warner Bros. While she was very good at playing ingénues, she was capable of playing so much more. Character actor Jay Gerber, who guest starred on shows from Love, American Style to Gilmore Girls, died on October 2 2015 at the age of 86. Jay Gerber was born on April 18 1929 in the Bronx, New York. He served in the Korean War. He made his television debut in 1956 in an episode of Producer's Showcase. He would not appear on television again until 1973 when he guest starred in an episode of Love, American Style. He made his film debut in 1975 in Dog Day Afternoon. In the Seventies he guest starred on such shows as Good Heavens, The Blue Knight, All in the Family, The Rockford Files, Eight is Enough, Chico and the Man, One Day at a Time, and Barney Miller. In the Eighties he guest starred on such shows as Too Close for Comfort, The Fall Guy, M*A*S*H, The Greatest American Hero, The Twilight Zone, Night Court, Knot's Landing, and Dallas. In the Nineties he guest starred on Doogie Howser M.D., L. A. Law, Martin, and Gilmore Girls. He appeared in the film Memoirs of an Invisible Man (1992). In the Naughts he guest starred on Alias and Any Day Now. 50 Years Ago Today The Who Recorded "My Generation"
It was 50 years ago today, on October 13 1965, that The Who recorded the song "My Generation" at IBC Studios in London. Written by Pete Townshend, "My Generation" would become The Who's highest charting single in the United Kingdom and may well be the song most associated with the band. In 2000 VH1 ranked "My Generation" at no. 13 in their list of the 100 Greatest Songs of Rock & Roll. In 2004 Rolling Stone placed "My Generation" at no. 11 in their list of the 500 Greatest Songs of All Time. Pete Townshend's inspiration for "My Generation" was twofold. First, he drew upon his own life and his frustration with the older generations. Even though The Who was successful, Mr. Townshend was still often treated with disrespect by older individuals and those of a higher social status. Second, he was inspired by the "Young Man Blues" by legendary blues pianist Mose Allison. Like "My Generation", "Young Man Blues" dealt with the theme of youthful rebellion and frustration with older generations.The Who covered the song in live performances and the song appeared on both their album Live at Leeds and the documentary film The Kids Are Alright. One of the best known features of "My Generation" is Roger Daltrey's stutter throughout the song. The reason for the stutter is now unclear. Roger Daltrey credited The Who's manager Kit Lambert with the idea of the stutter as a way to simulate the sound of a Mod on speed (amphetamines). Pete Townshend said that "My Generation" started as a talking blues song like "Talkin' New York Blues" by Jimmy Reed and then went through a number of changes, after which he came up with the idea of the stutter. According to Keith Moon the stuttering came about entirely by accident when Roger Daltrey was trying to learn the song's lyrics and it was decided to keep the stutter. Regardless, the stutter would result in "My Generation" being banned by the BBC for a time, who thought it might offend those who stutter. "My Generation" was released as a single in the United Kingdom on October 29 1965. The song became the band's highest charting single in the United Kingdom, peaking at no. 2 on the British singles chart. "My Generation" also went to no. 3 in Canada and no. 9 in Australia. Curiously it did not do nearly as well in the United States. Released in the U.S. on November 5 1965, it only went to no. 74 on the Billboard Hot 100. It was only The Who's second single to make the Billboard Hot 100, the first being "I Can't Explain (which peaked at no. 93)". The song gave its name to The Who's debut album, My Generation, which was released on December 3 1965 in the United Kingdom and on April 1966 in the United States. As might be expected The Who performed "My Generation" on various television shows, including the American Broadcasting Company's show Shindig; the German show Beat Club; and legendary British show Ready, Steady, Go. The most famous performance of the song on television would air around two years after it was released. On September 15 1967 The Who appeared on The Smothers Brothers Comedy Hour, performing "I Can See for Miles" and "My Generation". Drummer Keith Moon and a stage hand overloaded his drum kit with explosives. At the end of "My Generation" Keith Moon detonated the explosives, which went off with unexpected effect. Reportedly Keith Moon's arm was injured by shrapnel from the blast. Pete Townshend attributed the start of his partial hearing loss and tinnitus to the explosion that took place during The Smothers Brothers Comedy Hour. While "My Generation"did poorly in the United States upon its initial release, it has since become possibly their most famous song. It has remained part of The Who's sets at concerts ever since its release. It has also been used in numerous television shows and movies. Here it The Who's performance of the song from the German music show from the Sixties, Beat Club. I have to confess that I have had a crush on Rita Moreno ever since I was a lad. I am not absolutely certain where I first saw her, but it may well have been on The Electric Company, an educational children's show on which she was a regular. Of course, it is also possible I may have first seen her in West Side Story (1961), which still aired on prime time network television in the Seventies. Regardless, I remember seeing her throughout the Seventies, not only on The Electric Company and various movies, but also in guest appearances on such shows as Hec Ramsey, The Muppet Show, and The Rockford Files. Even now it is easy for me to understand why I had a crush on Miss Moreno. She is talented, beautiful, and has a great pair of legs. Of course, as a boy I did not quite realise just how singular Rita Moreno is. Even before I was born she was only the second Puerto Rican to ever win an Oscar. By the time I was fifteen she would become the only Hispanic and one of the very few performers to win all four major awards in American entertainment: an Oscar, Grammy, a Tony, and an Emmy. She is also set to receive the Kennedy Centre Honour for her long career in entertainment later this year. Rita Moreno was born Rosa Dolores Alverío in Humacao, Puerto Rico on December 11 1931. As a child she was nicknamed "Rosita" (the diminutive of "Rosa"). She spent her early years in Juncos, Puerto Rico. It was when Rita Moreno was around five years old that her mother left her father and moved to New York City, taking young Rosita and her younger brother Francisco with her. It was not longer after the family moved to New York City that young Rosita began taking dance lessons, training under Paco Cansino, an uncle of Rita Hayworth on her father's side. It was not much later that she began performing at the department store Macy's children's theatre, as well as at such occasions as weddings and bar mitzvahs. She was only eleven years old when she began dubbing American movies into Spanish for distribution in Latin countries. She made her debut on Broadway when she was only thirteen in the play Skydrift, using the stage name Rosita Cosio. Rita Moreno made her film debut in 1950 in the film So Young So Bad. She was billed as "Rosita Moreno", having taken the surname of her stepfather. So Young So Bad led to a meeting with none other than Louis B. Mayer himself, who signed her to MGM. It was with her second movie and her first with MGM, The Toast of New Orleans (1950), that she became "Rita Moreno". While Rita Moreno would see her film career blossom, the Fifties were not the best time to be an extremely attractive, Hispanic actress. Often the roles she had to play were outright stereotypes--the hot tempered, sexualised Latin spitfire. She appeared in these sort of roles in such films as The Fabulous Senorita (1952), The Ring (1952), Latin Lovers (1953), and Jivaro (1954). When she was not playing Latin stereotypes, she was often called upon to play various "exotic" roles. She played a Tahitian in Pagan Love Song (1950), an Arab in El Alaméin (1953), and a Native American in The Yellow Tomahawk (1954). Fortunately, not all of Rita Moreno's roles in films in the Fifties were stereotypes or "exotic" roles. In fact, this is the case with what might be her best known role from the decade. In the classic Singin' in the Rain (1952) Miss Moreno played Zelda Zanders, a thinly veiled parody of Clara Bow (while Clara was the "It Girl", Zelda is the "Zip Girl"). The part was not a particularly big one, but it was pivotal to the film's plot. Quite simply, Zelda was the friend and informant of the movie's antagonist, Lina Lamont (played by Jean Hagen). In the 1957 adaptation of James Fenimore Cooper's The Deerslayer Rita Moreno played the female lead role of Hetty Hutter. Rita Moreno also played Sandra Roberts in The Lieutenant Wore Skirts (1956). Rita Moreno's film career in the Sixties would begin on a high note. Indeed, the decade arguably began with what might be her best known film role of all time. She played the role of Anita in the 1961 adaptation of the Leonard Bernstein and Stephen Sondheim's Broadway Musical West Side Story. The role had been originated by Chita Rivera, and Jerome Robbins wanted her to play Anita in the film as well. Fortunately for Rita Moreno, the studio chose her for the role instead, Miss Moreno already being an established name in movies. As it turned out, she won the Oscar for Best Supporting Actress for her role as Anita in West Side Story. Curiously, even though the film deals with a Puerto Rican gang, Miss Moreno was the only actual Puerto Rican in the cast! Unfortunately winning an Oscar did not change the fact that the film roles being offered Rita Moreno were mostly stereotypes. She played the sultry actress Rosa Zacharias in Summer and Smoke (1961) and Sisa, a member of a band of guerillas fighting the Japanese, in Cry of Battle (1962). Afterwards she would not appear in another film for six years. Tired of being offered hot blooded Latinas and sexpots. she turned her back on Hollywood and concentrated on the stage instead. She did appear occasionally on television during this period. She returned to movies with The Night of the Following Day in 1968, playing a stewardess who also happens to be an accomplice to a kidnapping. The following year she played the title character's girlfriend Lupe in Popi (1969) and exotic dancer Dolores in Marlowe (1969). The Seventies would begin with Miss Moreno playing the small role of Louise in the controversial film Carnal Knowlege (1971), but in the Seventies she would ultimately concentrate on television and the stage rather than film. She appeared in Shhh (1975), The Ritz (1976--an adaptation of the Broadway play in which she also appeared), The Boss' Son (1978), and Happy Birthday, Gemini (1980). The Eighties also saw Miss Moreno concentrating primarily on television and the stage. Beginning with the Nineties Rita Moreno once more began appearing frequently in movies. In the Nineties she appeared in such films as Age Isn't Everything (1991), I Like It Like That (1994), Angus (1995), Slums of Beverly Hills (1998), and Carlo's Wake (1999). In the Naughts and the Teens she appeared in such films as Piñero (2001), Casa de los babys (2003), Play It by Ear (2006), and Six Dance Lessons in Six Weeks (2014). Her next movie, Remember Me, is set for release next year. Of course Rita Moreno not only has a film career, but also has an extensive career in television. Unfortunately her early roles on television in the Fifties tended to be much like her film roles in the Fifties--Hispanic stereotypes and "exotic" roles. Indeed, on an episode of Father Knows Best she even played an exchange student from India! In the Sixties she guest starred on an episode of Burke's Law in which she did not play a stereotype, nor were her roles on television shows in the Seventies stereotypes either. When it comes to television many people of a certain age may best remember Rita Moreno as part of the ensemble of The Electric Company. 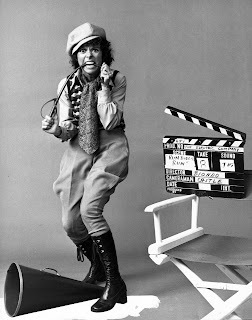 Produced by the Children's Television Workshop (the same people who make Sesame Street), Miss Moreno appeared on the show for the entirety of its six year run. The show actually gave her a chance to display her gift for comedy, as well as her range. She played such recurring characters as Millie the Helper (an overly eager trainee in various jobs), Pandora the Little Girl (a rather bratty child), Carmela (her one straight forward character), and even Otto the Director (a very temperamental movie director). During the Seventies she also guest starred on such shows as Hec Ramsey, Medical Centre, Lanigan's Rabbi, and The Rockford Files. Her memorable guest appearance on The Muppet Show won her the Emmy for Outstanding Continuing or Single Performance by a Supporting Actress in Variety or Music. The Eighties saw Rita Moreno play two regular roles on television. In the short lived sitcom based on the movie 9 to 5 she played Violet Newstead (the character played by Lily Tomlin in the film). In the short lived mystery series B. L. Stryker she played Kimberly Baskin. During the decade she also guest starred on The Love Boat, The Cosby Show, The Golden Girls, and Miami Vice. In the Nineties Rita Moreno was one of the stars of the short-lived sitcom Top of the Heap and she had a recurring role on The Cosby Mysteries. She provided the voice of Carmen Sandiego in the animated cartoon Where on Earth Is Carmen Sandiego? Her highest profile role on television in the decade may have been that of Sister Pete, the nun and psychologist on HBO's popular series Oz. She also guest starred on such shows as Hearts Afire, The Nanny, Murphy Brown, and Touched by an Angel. 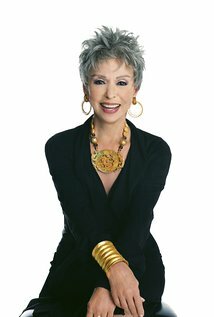 In the 21st Century Rita Moreno has played regular roles on both the short lived drama Cane and the sitcom Happy Divorced. She has guest starred on such shows as American Family, Law & Order: Special Victims Unit, Law & Order: Criminal Intent, and Jane the Virgin. Rita Moreno is one of the few performers who not only has had a successful career in film and television, but also on stage. Indeed, as mentioned earlier, she appeared on Broadway before making either her film or television debuts. She made her debut on Broadway in Skydrift in 1945. In the Sixties, at a time much when she was not making movies, she concentrated on her career on Broadway. She appeared in the productions The Sign in Sidney Brustein's Window, Last of the Red Hot Lovers, and Gantry. She continued her career on Broadway in the Seventies. She won the Tony Award for Best Featured Actress in a Play for The Ritz (1975). She also appeared in the play The National Health. In the Eighties she appeared in Wally's Cafe and the female version of The Odd Couple. For her role of eternal slob Olive Madison in The Odd Couple she won the Sarah Siddons Award. In 2011 she began acting in an autobiographical, solo show called Rita Moreno: Life Without Makeup. At age 83 Rita Moreno is still going strong and continues to act. She shows no sign of stopping. What is more, she looks much younger than her actual age. If Rita Moreno looks eternally youthful, it is probably because she has never stopped working, and she has never stopped working because she is one of the most remarkable actresses of the late 20th Century. At a time when young actresses were expected to be little more than pretty, Rita Moreno not only had the talent to play nearly any role given her, but also the strength and determination to fight playing ethnic stereotypes and sexualised characters. In the Sixties when she continued being offered stereotypical roles in film, she simply turned to television and Broadway. If Rita Moreno remains one of the best known Hispanic actresses of all time, it is perhaps in part because she fought for her right to be treated with dignity and respect. Of course, the longevity of Miss Moreno's career has probably been helped by the fact that she is one of those performers called a "triple threat". She can not only act, but she can also sing and dance. In fact, I always thought that she would have made a much better Maria than Natalie Wood in West Side Story. Never mind that Rita Moreno actually is Puerto Rican in descent and drop dead gorgeous, she could also dance and, if the producers had let her, sing as well (as Anita some of her vocals were dubbed by Betty Wand and a few by Marni Nixon). It's little wonder that Rita Moreno excelled on Broadway and on variety and sketch comedy shows like The Muppet Show and The Electric Company, as she could do everything from comic sketches to singing. Indeed, had she been born twenty years earlier I can only believe she would have become a major musical star. If I still have a crush on Rita Moreno, it's not simply because she is beautiful and has a great pair of legs. It is because she is simply one of the most talented actresses around, and one who is also intelligent, charming, and strong willed enough to fight Hollywood stereotyping. If Hispanic actors and actresses have a wider array of roles available to them now, it is because Rita Moreno and others like her broke down the barriers for them. Today I was busy getting a very special blog post ready for tomorrow. With Halloween only weeks away, I then thought I would leave you with a suitable song. Here is "Feed My Frankenstein" by Alice Cooper. The song was recorded for Alice Cooper's 1991 album Hey Stoopid. It made a significant appearance in the 1992 movie Wayne's World. It didn't chart in the United States, but it went to no. 27 in the United Kingdom.